We had a terrible second nights sleep in Vis. Every other night the evenings were distinctly cool but this was like sleeping in a sauna. Coupled with that the wash, not from ferries but just the way the wind was blowing into Vista Luka, was throwing the boats all over the place. Ours, and our neighbours, were bouncing up and down constantly and noisily. I got up around 5am to check fenders after a particularly large slap. We were all pretty tired when we slipped our moorings at a record early 0835. Without sails it was pretty unpleasant trying to make some breakfast and before long we had the sails up in 13 knots and Harry was helming us on a beam reach at around 7-8 knots. We were aiming for the Šolta Channel between the islands of Brac and Šolta. It was about a third of a mile wide and with the number of yachts and ferries coming out resembled the Solent. Quite exciting really, us being on starboard and most others on port coming the other way. 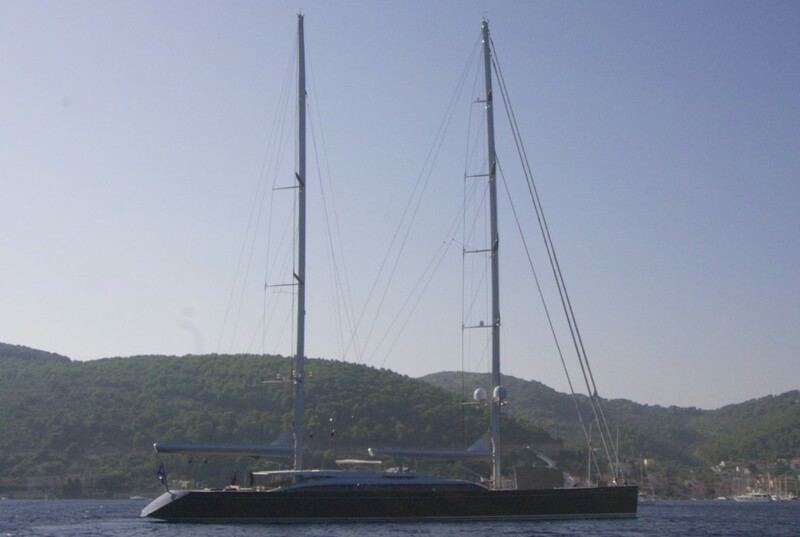 We overtook another yacht on the approach to the channel and gave him a wide berth before bearing away into a broad reach up the northern coast of Šolta. For the last hour the wind had been picking up, peeking at 18 knots, and I broke the record at 9.4 knots boat speed. We had a fair amount of heel but the boat was never quite overpowered as we left the equivalent of about a reef in the furling sails. 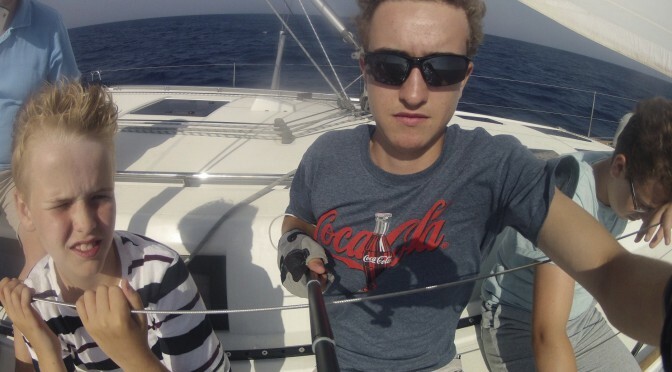 Harry said it was the best sail yet which made me feel great. 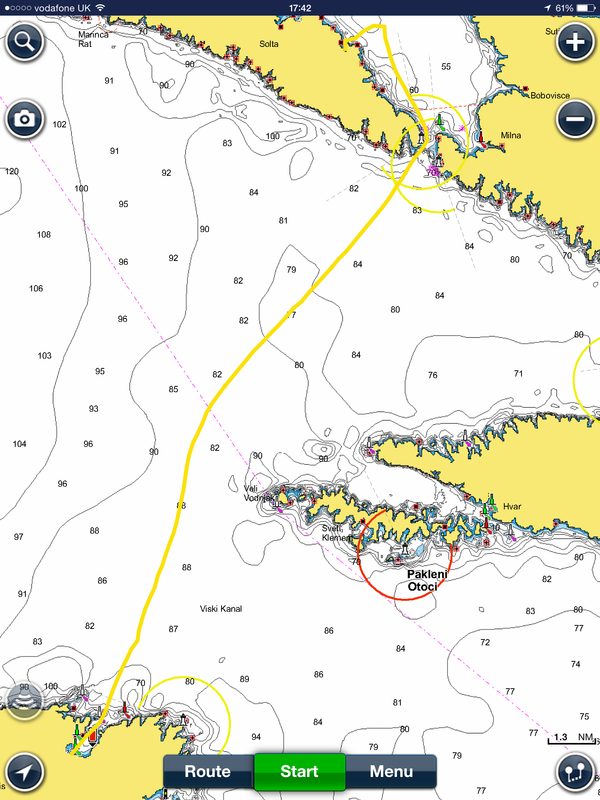 The small harbour of Stomorska was quite difficult to spot by day as the red marker is a narrow post (lit at night) and we put the sails down outside. Motoring in we could several spaces and had an uneventful tying up. Little did we know we got the last spot, the others having been reserved. The harbour master probably turned away a dozen of more boats during the next hour, including a French crew who got their keel tangled on our mooring line.